Mercure 720 Sirius Manual Start Sealer Regular Tray 11.5″ – for Stacked Envelopes only. Up to 300 envelopes per minute with variable speed, 3.50″ to 9.754″ deep – 11.5″ length. Mercure 720 Venus Auto Start/Stop Sealer Regular Tray 11.5″ – for stacked Envelopes only. Up to 300 envelopes per minute with variable speed, 3.50″ to 9.754″ deep – 11.5″ length. Seals most flap shapes including pointed and rounded from 1.38″ up to 338″ flaps requires optional large envelope sealing kit. Increases productivity and saves wear and tear on your equipment now being used for just sealing. 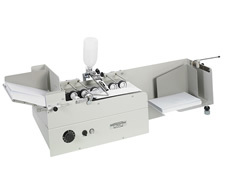 The Mercure 720XL Automatic Envelope Sealer is the practical, economical way to seal your envelopes; hands free!